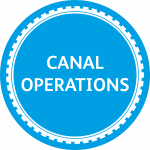 Works to replace the lock gates at Lock 6, Bankside on the Forth & Clyde Canal East are due to begin in February 2019. Following an incident in 2018, when a hire boat collided with Lock 6 at Bankside, the Forth & Clyde Canal East was closed to boating traffic. After entering the lock chamber, the boat hit the bottom gate, damaging both the lock gate and walkway beyond repair. Operations staff made the site safe by chaining the gate into the recess, closing off the walkway and removing the boat. Site works to replace both the upstream and downstream lock gates will be carried out by the Scottish Canals Maintenance Team and our contractors Mackenzie Construction, and are due to begin in February 2019. The gates are currently being fabricated by a specialist supplier in England and are due to be delivered and assembled in March 2019.